Quickly bring all your facilities into compliance with regulatory safety standards. 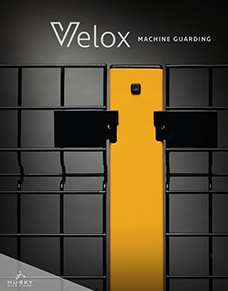 Velox is the most innovative and versatile machine guarding system that can provide a safe perimeter in any facility. See it in action and explore panel, post and door options that can be quickly combined and easily modified in the space for all projects large and small. Our non-progressive panels allow you to remove a single panel without taking down the entire run, ensuring quick panel removal and replacement. 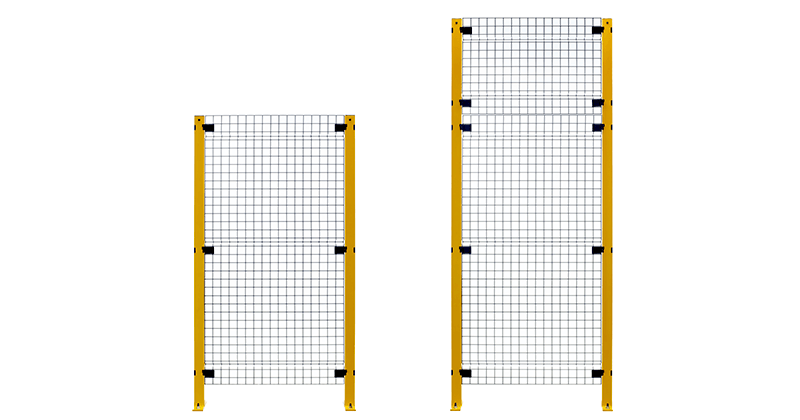 Unframed wire mesh panels offer the flexibility to customize in the field. Ridges bent into the panel provide strength without the cumbersome weight of typical framed panels. Standard black painted panels create high-visibility system. Wire panels are made of 2-inch x 2-inch x 8-gauge welded wire mesh. Panels also available in clear Lexan and solid sheet metal. 2,500-pound weight limit for single 48-hour Quick Ship orders. 5,000-pound limit for orders shipped in 5-7 days. Panels in 6- and 8-foot heights with 6-inch sweep at floor. Four Velox post designs accommodate every combination of panel and door for a system that fits your machinery and space. Four post styles accommodate: (1) swing doors, (2) slide doors, (3) adjustable corner posts for non-90 degree corners, and (4) line posts for straight runs and 90-degree corners. 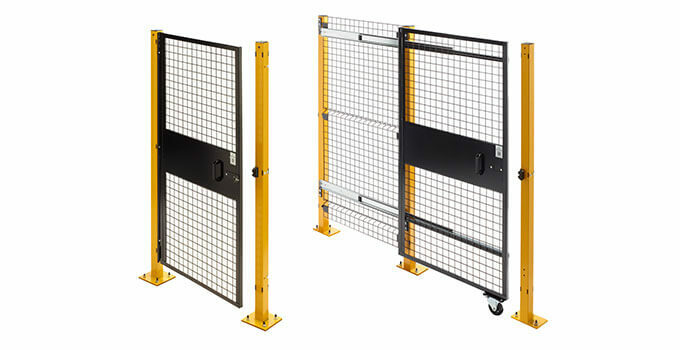 Heavy duty anchors are included with every post order to ensure strength and stability. 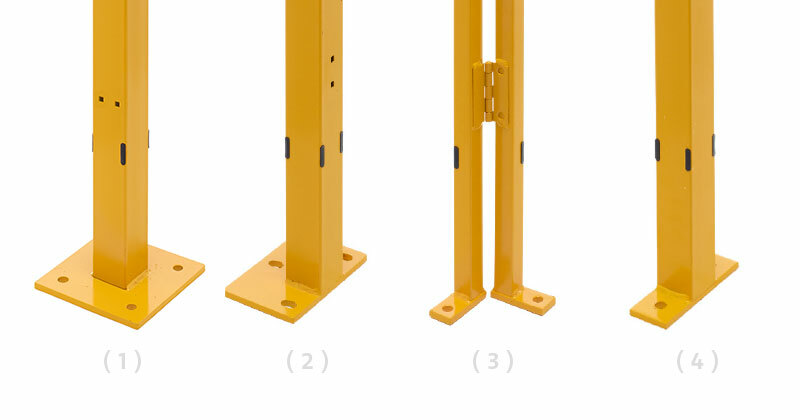 All Velox posts come in standard safety yellow paint color. Post height equals overall height of assembled systems. Posts in 6- and 8-foot heights. Swing and slide door options allow for the access that best fits your facility and the machinery being operated. Swing door styles include single or double swing, available hinge left or right. Swing doors are available in 6- and 8-foot heights; 8-foot option has 12-inch transom above the door. Double swing door is available in 6- and 8-foot options. Single slide door is available in 6- and 8-foot heights, sliding left or right. Double slide door is available in 6- and 8-foot options. All doors are equipped with a standard snap latch. Fortress electric auto shut-off door locks are also available and can be set up in the field. Swing door is available in 6- and 8-foot heights with 3 and 4-foot widths. Slide doors available in 6- and 8-foot heights; single slide doors in 3-, 4- and 5-foot widths; double slide doors in 6- and 8-foot widths. After installing our Velox machine guarding cell, I can safely say that this is the best guarding we have ever used. Assembly was incredibly fast and easy, there is no loose hardware to keep track of and you can easily modify the panels in the field! The Velox Machine Guarding design made installation easier than any guarding I have worked with to date. Having had serious concerns about the modifications required to conform the fencing to the ASRS design, I was pleasantly surprised at the ease with which our team was able to configure the fence. In the end, I could not envision a more efficient or cost effective solution to the challenge. I have worked with Husky Rack as one of our supplier’s for 13 years now and I have always received great customer service from them and have always received email replies quickly. Husky Rack’s lead times and on-time shipments are never an issue. I have really enjoyed working with them as one of our major suppliers.